For more information please call 612.940.2632. Sign up now for our monthly newsletter and receive an added bonus of special discounts on quality used injection molding machinery! This late model used injection molding machine is in excellant condition. We Buy Used Injection Molding Machines! Need a quality used injection molding machine, let us help you find just what you are looking for. Have a machine in mind but cannot find it, let us help! We are now adding a "Wanted" section, allowing you to advertise your requirements, as well as your equipment for sale. 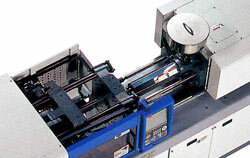 Email us today and we will post the exact machine requirements you are looking for.